Blitz through your laundry pile with this steam generator iron from Bosch. The amazing CeraniumGlisseePro soleplate works with the clever AdvancedSteam System to evenly distribute steam, so it’ll effortlessly glide over any fabric. From denim skirts to cotton shirts, it’ll iron everything perfectly on the single i-Temp Advanced setting, so you won’t have to keep adjusting the dial when there’s a lot to get through. It’ll come in handy during the pesky flu season as well, because HygenicSteam Technology uses super-hot temperatures to remove bacteria from your laundry. And, the Calc'n'Clean Perfect feature removes any limescale build-ups too, so it’ll keep performing at its absolute best. Gets ironing done in half the time. Easy to descale too. Bought this iron as a replacement for my old faithful Tefal steam generator iron that I had for more than 9 years. I tried other Tefal replacements before settling for this Bosch TDS6081GB. 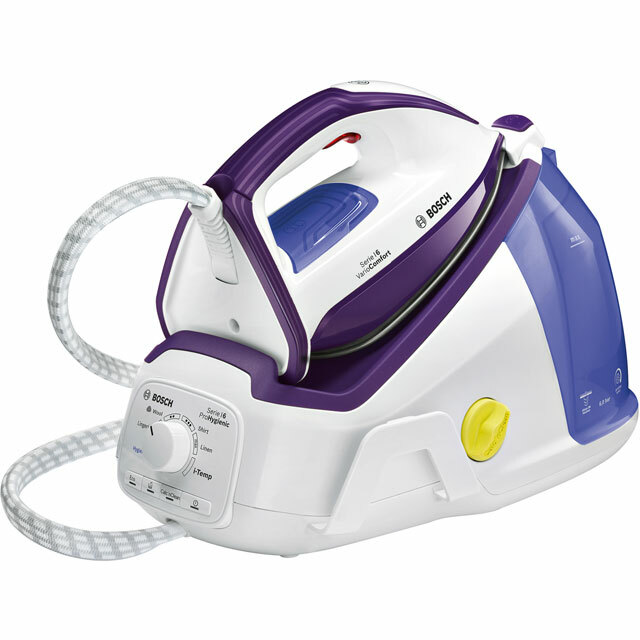 This iron is lighter and has some good features like it beeps when ready to use, indicators for low water level, calc- indicator, eco mode, etc. The steam control function is great allowing the right pressure setting for the type of garment. I have never had a bosch iron before but I would have preferred a rewind cord and better storage for the flex also it’s hard to empty as the tank is fixed,you have to turn the unit upside down to empty it, which I find hard as my lifting power isn’t good,but on the plus side it’s lightweight and irons perfect, I wouldn’t buy this model again for the above reasons.